The Benedictine monk and bishop, who served as a missionary to pagans and a reformer of the Church in southeastern Germany, was born around 934 in the historic southwestern German region of Swabia. Wolfgang came from a family of nobility and was privately tutored as a child. Later on, the future monk was educated at the renowned Monastery of Reichenau, and at Wurtzburg. Wolfgang showed intellectual prowess and found companionship during his years of study, but was also dismayed by the petty jealousies and moral lapses he observed in Wurtzburg’s academic environment. In 956, his school companion Henry was chosen to lead the Archdiocese of Trier. Though Wolfgang had become interested in monastic life, he chose to go with Henry to Trier, where his service to the Church included a teaching position in the cathedral school. After Archbishop Henry’s death in 964, Wolfgang left Trier, became a monk of the Order of Saint Benedict, and settled at a monastery in the diocese of Augsburg. Its school prospered under his direction, and the local bishop – the future St. Ulrich – ordained him to the priesthood in 968. In his youth, Wolfgang had envisioned a secluded life of contemplation; but things turned out differently, as he was sent east to evangelize the Magyars in 972. By Christmas of that year, Wolfgang had been chosen as the new Bishop of Ratisbon (present-day Regensburg in Bavaria). But he continued to live out his monastic vocation, retaining his distinctive Benedictine habit and dedicating himself to the same ascetic lifestyle. Amid the work of preaching and reform, Wolfgang remained a man of prayer, silence, and contemplative solitude. Not surprisingly, the Bishop of Ratisbon made monasticism a focus of his church reforms, reviving religious life in places where it had fallen into disorder. Wolfgang also showed extraordinary care for the poor in his diocese, to such an extent that he was called “the Great Almoner.” On the other hand, he was also involved in affairs of state at a high level, and tutored the children of the Duke of Bavaria, including the future Holy Roman Emperor St. Henry II. Wolfgang, despite being one of the great bishops and saints of his time, still encountered serious difficulties in his leadership of the Diocese of Ratisbon. On one occasion, a political conflict caused him to withdraw from his diocese to a hermitage for a period of time. Wolfgang is also said to have struggled with the great geographical extent of the diocese, parts of which were eventually entrusted to the Bishop of Prague. In 994, while traveling in Austria, Wolfgang became sick and died in the village of Pupping. Miracles associated with his tomb, including many healings, led to his canonization of 1052. 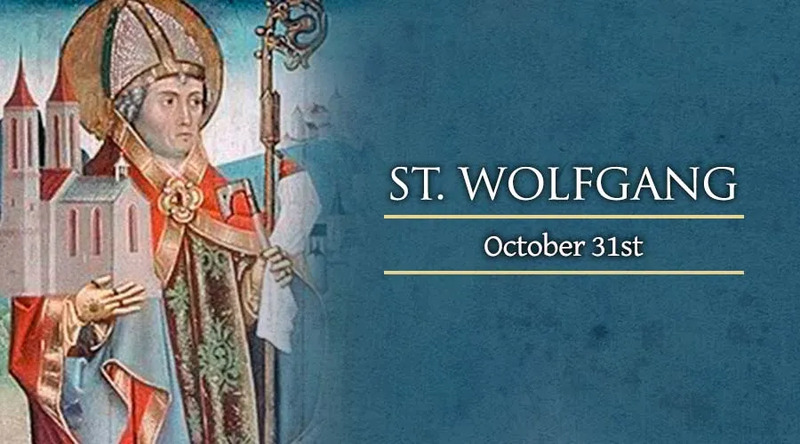 Several of St. Wolfgang’s devotees experienced relief from stomach ailments, and he remains a patron saint of such troubles today. His intercession is also sought by victims of strokes and paralysis, and by carpenters.